Most people aren't aware that Google provides a page dedicated to giving users to see a pretty extensive list of their activities on various services. A few apps now provide links into this interface, and now Play Music joins the fold. 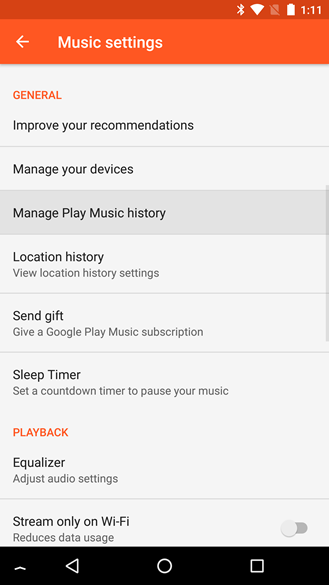 The latest update includes a new link in the Settings screen that opens up a reverse chronological list of your music searches going back to roughly November 2015 – that's where mine stopped, at least. Each entry in the list includes the date and time of the search, and they can be individually deleted; you know, just in case you'd rather forget the time when Carly Rae Jepson was popular. 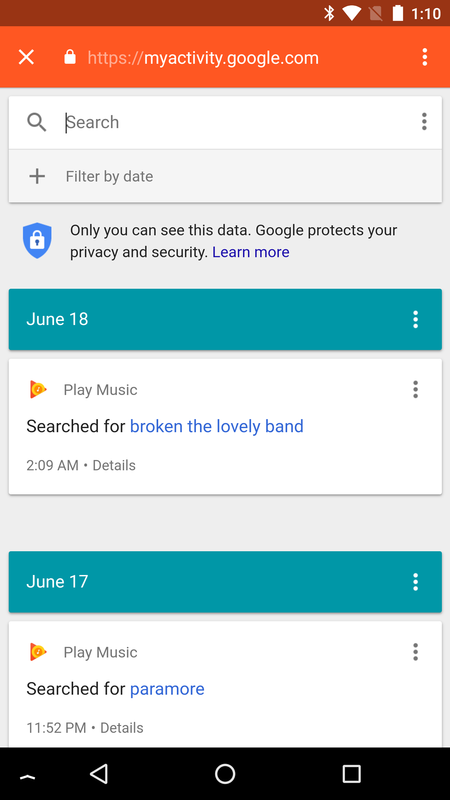 There is also a link to the search, but it somewhat ironically just returns to the Play Music app without actually launching a search. That will probably be fixed in the next update. The web interface doesn't appear to have this same shortcut anywhere within easy reach, but if you'd like to peruse your history without hopping over to the app, here's the link. 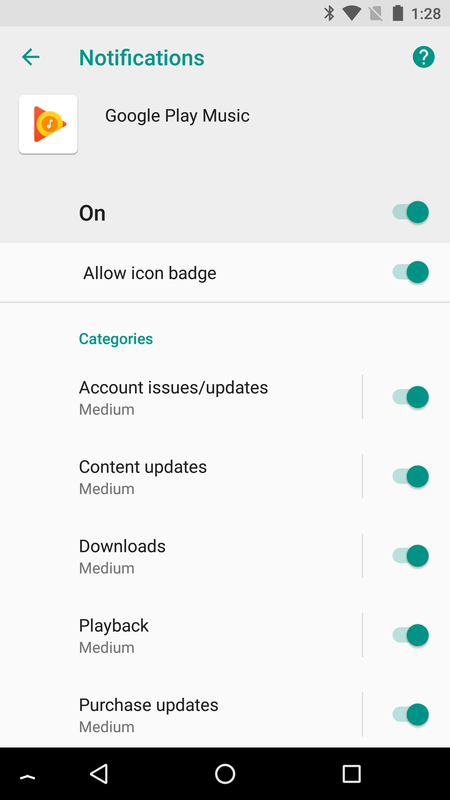 Every week or two another Google app gains proper support for Android O's notification channels, and it's Play Music's turn to hop aboard. This update adds five separate channels, including: Account issues/updates, Content updates, Downloads, Playback, and Purchase updates. If you've never been too keen on any of these types of notifications, it's a good time to make some adjustments to priority or turn them off completely. 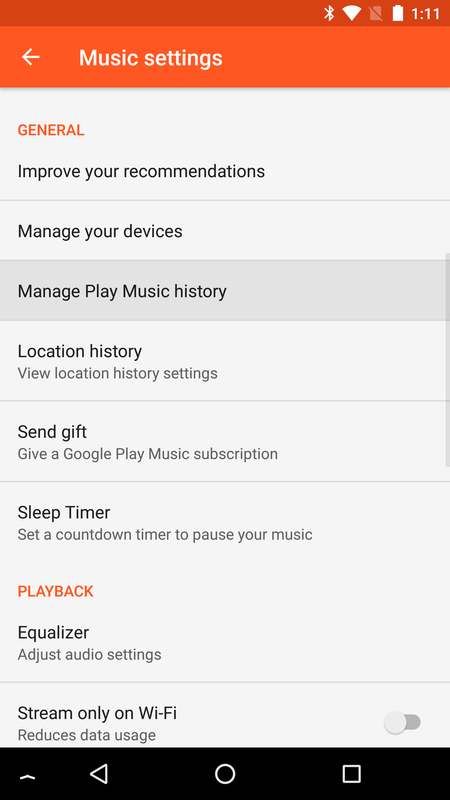 It's a small thing to mention, but I noticed in this update that the text has changed for Play Music's subscription text. It has just upgraded the text to say there are 40 million songs in the library instead of the previous 35 million. This is obviously not a big new contract, but just the gradual addition of newly released singles and albums, along with much older music that may have been too low of a priority to add in the past. This teardown topic actually belongs to the v7.8 update from a few weeks ago, but it was the only change and didn't warrant a post by itself at the time. A new line of text was added for "ultra high quality" audio. Judging by the phrasing of the text and string name, this is pretty clearly a description for individual tracks and not a label for the UHQ up-scaler available on some phones like the Galaxy S6 and later. Of course, that doesn't mean tracks won't include a little bit of data intended to work with the UHQ feature. Either way, this is obviously targeting audiophiles and may be limited to specific hardware or require extra actions to enable since it likely necessitates more bandwidth to stream.